Divorce can put a strain on every member of the family, especially children. It’s often challenging to be positive in a situation like this and see that it can be the best choice for future happiness. Divorce usually hits children the hardest. If they’re young kids, they may not be able to fully understand what is happening. However, it doesn’t matter what age they are; whether they’re toddler or teens — generally, their first instinct is to blame themselves. 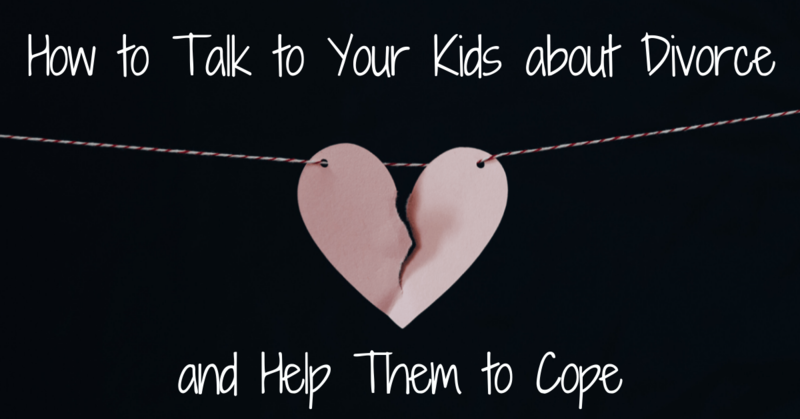 The good news is that you can do a lot to help your child cope with this tough transition and reduce some of the painful effects of divorce. The priority when getting a divorce from your partner is to consider how, when and what to tell your children. How you explain the divorce to your child will set the tone for their response. Children will naturally be anxious and worried. Talking to your kids about divorce should occur sooner rather than later. If possible, it’s best to tell your kids together as their parents. Try to discuss what you want to say to them beforehand so that you can be on the same page — this will also prevent the kids from hearing two different versions of events. Children will often have a lot of questions. They may want to know where and with whom they will live, when they’ll see each of you, and where they’ll go to school. If you know the answers, share this information with them then, otherwise, be honest and promise to tell them once it’s sorted out. 1. Keep an open dialogue by being open and approachable. Talk to your children about the divorce. The worst thing you can do is act like nothing is happening between the two of you. Even if you have some pent-up emotions about your ex-spouse, this doesn’t mean that you should shy away from the topic with your child. Be prepared to revisit discussions with your kids often. Even if you’ve talked a lot in the beginning, tell your kids they can talk to you about the divorce whenever they need to. You may sometimes ask your kids how they’re coping. When you bring up the conversation occasionally, it gives them the message that it’s okay to talk about the divorce. 2. Accept anger and disappointment from your children. Listen to how your kids are feeling and know that it is natural for them to have these emotions. Talk to your child about their fears. Allow your kids to cry if they need to do so. Make sure that you always offer an open ear for your child’s concerns. 3. No one is at fault. Make sure your children know that the divorce is not their fault. They won’t know the actual cause of the divorce, so they may resort to blaming themselves. They may even start to believe that there’s something they can do to patch up the marriage. Help them come to terms with these feelings. Even if you believe someone is at fault for the divorce, it’s critical to avoid pointing fingers or showing angry feelings around your children. These actions only cause them to withdraw and internalize their feelings. Regardless of your feelings towards your ex-spouse, allow your kids to maintain a positive relationship with both parents and show them that you trust them to adapt to the changes. 4. Let your children know that Mom and Dad still love them very much. With all of the changes going on in your child’s life, they need to know that one thing — the most important thing of all — isn’t going to change. Remember to give your kids lots of affection to reassure them of your love and support. 5. Provide stability. Although significant changes may occur, such as relocating, try to maintain your children’s familiar routines as much as possible. For example, keep bedtimes, meal times, and having friends over consistent. Kids feel safest in a routine environment. 6. Inform your kids of any changes ahead of time. When significant decisions are made in the family, ease your children into these changes. Let them know before the change happens, so they have some time to prepare themselves. Reassure them that you are considering their feelings too when making important decisions and that things will begin to improve. Gradual change is best for children. Make changes in their lives slowly and let them share how they feel about the changes. Praise your kids for making an effort to help with the changes. 7. Explain visitation. Explain the visitation arrangement to your children and tell them when they’ll be able to see each parent. If one parent doesn’t spend time with the children for one week, for example, be sure the child knows and has time to cope. Again, reassure your kids that you both love them and that they will still have special and fun times with both parents. Show lots of support. Support your child’s need to visit their other parent and their desire to love you both. Tell them it’s ok, and you support this. It will help them to cope even better. 8. Avoid negativity. If your ex-spouse has hurt you, it can be hard to avoid negativity. Unless your former partner has a history of harming your kids, it’s harder on them if you belittle your ex. Always take the high road and think of something positive to say about the other person. This eases some of the tension of the divorce for your child. Be fair when discussing the other parent. It’s painful for kids to be pressured to take sides and listen to an enraged parent. Try to find the strength to be civil towards and about each other. While you may not feel like it, it will be far kinder to your child and less painful for them. 9. Make arrangements for special occasions. Everyone should get consideration when it comes to special events such as birthdays or holidays. If you think you can be civil, try to share these times with your ex-spouse. If that’s not possible, evenly divide the time between both parents. You can split up morning versus afternoon, or alternate holidays. Don’t ask your child to deliver a message. If you need to talk to your ex-spouse about something, tell them yourself — call, text, or write them an e-mail. It’s unfair to use your child as a buffer and put them in an awkward situation. Never ask your kids which parent they care about more. Never use your kids as your counselor – find an adult to fulfill these needs for you, whether that’s a friend or a professional therapist. Stop and think about how your words may affect your kids. When your children are old enough to understand what you have been through, they will admire and appreciate you even more for caring about their needs and making these needs a priority. Divorce can certainly throw off your life’s expectations, but it doesn’t have to affect how you raise your children. Remember their needs, too, and you’ll both persevere through this trying time.